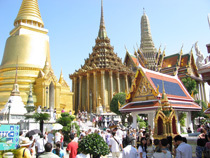 Bangkok (English pronunciation: /ˈbæŋkɒk/) is the capital and most populous city of Thailand. It is known in Thai as Krung Thep Maha Nakhon (กรุงเทพมหานคร, pronounced [krūŋ tʰêːp mahǎː nákʰɔ̄ːn] ( listen)) or simply About this sound Krung Thep (help·info). The city occupies 1,568.7 square kilometres (605.7 sq mi) in the Chao Phraya River delta in Central Thailand, and has a population of over 8 million, or 12.6 percent of the country's population. Over 14 million people (22.2 percent) live within the surrounding Bangkok Metropolitan Region, making Bangkok an extreme primate city, significantly dwarfing Thailand's other urban centres in terms of importance.